I almost missed this exhibition had I not been trawling art gallery sites and came across NN Gallery's which is holding this exhibition till next week. It was quite easy finding the location of the gallery which is just beside the MRR2. I only need to rely on the very well drawn out map on their website. The Friday morning was perfect as there were no visitors at the gallery and the works featured at this exhibition are a feast to the senses, especially if you love watercolour works - just as most of MWO's shows in you recall. Remember its landmark watercolour competition entitled "Enchanted Land, Colourful Life", held last year at the National Art Gallery? The works at this show are highly interesting. Several pieces stood up and one I must mention is Sharifah Zuriah's piece on a hillscape which looks an interesting blend of Chinese brush and watercolour mix. It features a granite outcrop with a blue sky as background. This artist never fails to amaze me. 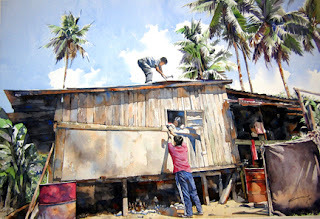 Rafiee Abdul Rahman's piece, A Street in Nepal, was also another interesting one although I liked his seaside scenes (with the characteristic coconut trees with its palm fronds flaying in the wind) better. Other works included those by Dr Wong Seng Tong (he did a Balinese piece), Cheah Yew Saik (with his clouds scene, well executed on this particular art paper), Calvin Chua (with two large pieces of morning glories vines on old bicycles) and of course, the bicycle expert himself, Chow Chin Chuan. You have until April 4 to enjoy the exhibition and I suggest you go take a look. I was a little disappointed because MWO did not produce a catalogue for this one. It would have been an interesting souvenir to purchase!